Jane LaFazio shows us how to applique and embroider little heart pockets — the perfect wrap for a teeny valentine gift. See her tute. 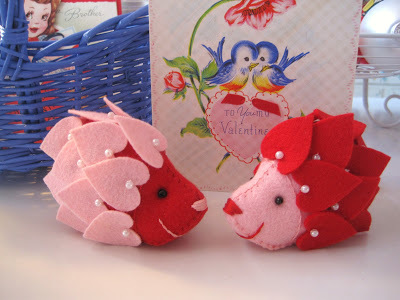 Cutest valentine pincushions ever. The pattern for these adorable hedgehogs is free from Creative Breathing. Get it now. Here’s a no-calorie treat you can make for a book-loving valentine. It’s quick and easy to create, and it has passed the “man test”! Go to the tutorial by Jules on her Adventures in Thread blog.